Made of mahogany, just like the classics, the DT520 Destroyer's iconic body style has attracted many artists. Ibanez's biggest leap forward will continue to be appreciated by today's player: namely the mahogany slim neck grip and set-in neck that offer ultra-smooth playablity. No matter what the setting, the DiMarzio Air Norton pack this axe with a rich tonal palette. Gorgeous old school pearl/abalone block inlays make for a path back to one of rock's most dynamic chapters. The original Ibanez Tight-Tune bridge provides improved transfer of string vibration and better tuning stability. 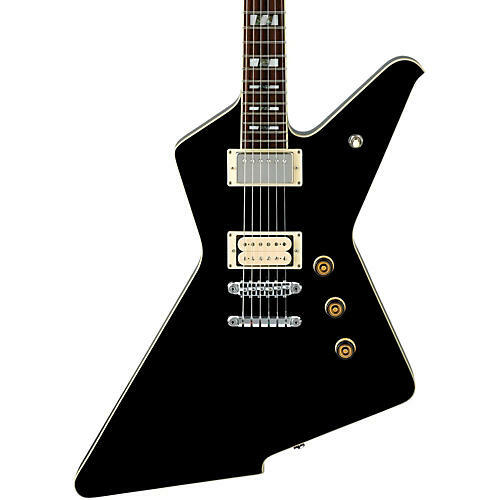 Since it was originally introduced in 1975, the Destroyer has become an icon of that era's chapter in rock n' roll history. Over the years it has undergone many incarnations and the perennial classic returns once again. The body and neck of both guitars are made of a tight Mahogany for maximum resonance. The bound rosewood fingerboard is adorned with Jumbo frets. The Destroyer also features Sure Grip III control knobs for no-slip control. It's not called the Destroyer for nothing.